24 Reasons to Believe Hell Is a Reality. William Booth, founder of the Salvation Army and a man who dedicated his life to lifting the poor out of sin and poverty, reportedly made this state­ment: "Most Christian organizations would like to send their workers to Bible college for five years. I would like to send our workers to hell for five min­utes. That would prepare them for a lifetime of compassionate ministry." Booth never suggested that the des­perate people he served were "already in hell." He believed in a real, eternal hell, and it drove him to rescue people from both their current plight and future perdition. Shortly before his death in 1912, Booth warned prophetically that he saw coming to the church, "forgiveness without repentance, salvation without regeneration ... a heaven without a hell." In today's theological fog, his ominous caveat is unfolding. Even some who claim to believe the Bible are having second thoughts about eternal judgment, and others have rejected the notion of judgment altogether. The name usually given this teaching is Universalism. Universalism basically is the belief that all people will be saved. Jesus' death and resurrection will automatically, or at least eventually, save the whole human race. Personal repentance and faith in Christ are not necessary for going to heaven. The Christian mission is reduced to announcing to people the "good news" that they are already saved. But does Scripture teach that everyone will be saved? There is overwhelming biblical evidence to the contrary. Quick: Where is Christ prophesied in the book of Numbers? What problem was Moses addressing when he wrote Leviticus? What do the dietary laws have to do with Jesus? If you can’t answer these questions, you’re not alone. Though in 2015 we have greater access to Scripture than at any other time in history, we seem to know less about it than ever. And that’s probably putting it mildly. A joint report last year by Barna and the American Bible Society found 81 percent of American adults consider themselves “highly,” “moderately,” or “somewhat” knowledgeable about the Bible. But less than half could name its first five books, and just as many respondents thought John the Baptist was a disciple. Americans “consider the Bible to be important in a general sort of way,” said Kenneth Berding, a professor of New Testament at Biola University. But that rarely translates into actually studying or understanding it. For many, the Bible is a decoration on the mantelpiece, seldom dusted off or given more than a passing glance. And the reason that we, despite identifying as a majority Christian nation, are biblically illiterate really boils down to this: We just don’t read it. "The author, Rick Mathes, is a well-known leader in prison ministry. The man who walks with God always gets to his destination. If you have a pulse you have a purpose. The Muslim religion is the fastest growing religion per capita in the United States, especially in the minority races. Last month I attended my annual training session that's required for maintaining my state prison security clearance. During the training session there was a presentation by three speakers representing the Roman Catholic, Protestant and Muslim faiths, who each explained their beliefs. There was no disagreement with my statements and, without hesitation, he replied, “Nonbelievers"
The expression on his face changed from one of authority and command to that of a little boy who had just been caught with his hand in the cookie jar. Needless to say, the organizers and/or promoters of the “Diversification” training seminar were not happy with my way of dealing with the Islamic Imam, and exposing the truth about the Muslims' beliefs. FOR CHRIST'S SAKE... SEND THIS ON"
During the 2013 terror attack at the Westgate Mall in Nairobi, Kenya, al Shabaab gunmen paused for a moment and made an announcement in Swahili: All Muslims could come forward and leave. Among those trying to escape was Joshua Hakim, who covered up the Christian name on his ID as he showed it to the gunmen. Other terror attacks by al Shabaab, a Somali terrorist group with ties to al Qaeda, have followed a similar pattern. Those who could prove they were Muslim—by reciting a prayer in Arabic or answering questions about Islam—were allowed to go free. Those who couldn’t were killed. As a result, some Kenyans have begun to share tips online about how to pretend to be Muslim, just in case. This includes learning to recite the shahada—Islam’s main creed—in Arabic. 'And now let Pharaoh look for a discerning and wise man and put him in charge of the land of Egypt,' Genesis 41:33. In addition to giving Joseph the interpretation of Pharaoh's dream, God also shared with Joseph his means of saving the Egyptians from certain starvation. Now Joseph could have confined himself to interpreting Pharaoh's dreams. That is all that he was asked to do. But Joseph's heart was full of love and concern for others. We saw it in his attitude to the prisoners he served whilst he was in prison. We see it again now as he shares with Pharaoh the remedy by which the nation could be saved from impending doom. It is a big temptation to do the bare minimum required of us, to do merely what we are asked for or what is demanded of us. Jesus told us that we should be willing to do more than expected or demanded. 'If someone forces you to go one mile, go with him two miles,' Matthew 5:41. In doing so people will realise that we are different, that we possess something different inside. Pharaoh realised that there was something exceptional in this man, 'Can we find anyone like this man, one in whom is the spirit of God?' What was it that Pharaoh saw in Joseph that caused him to have that opinion? We know that Pharaoh observed the spiritual gifts of discernment and wisdom (v39), and no doubt the love, that God the Holy Spirit had given Joseph. Now, it is one thing to recognise a problem, to see a need. It is something else to know what would resolve it, and yet another thing to have the practical skill to do what is needed. Often it requires three very different people, one to diagnose or identify the issue, another to work out how it might be resolved, and yet another with the practical skill needed to do it. The Protest of an Upright Man! "Brother Wilkerson, what has happened to you? You used to preach so powerfully against sin. But I believe you've gone soft on sin lately. Your recent message on Jubilee gives people a license to sin. You're offering comfort to compromisers, instead of convicting them! "Go back to preaching holiness! I don't commit sin, and I have no sin in my life. No person has to commit sin." He went on for several paragraphs about the lack of reproving in my preaching. Please understand - if there is one thing I greatly fear as a preacher, it is that my sermons might condemn the righteous and comfort the wicked. I tremble as I read these words: "He that justifieth the wicked, and he that condemneth the just, even they both are abomination to the Lord" (Proverbs 17:15). I believe any true minister of God who preaches a pure gospel will show people their wicked ways. He will point out sin in order to reveal the difference between the holy and the profane. Thankfully, I believe the Lord has helped me to do this. 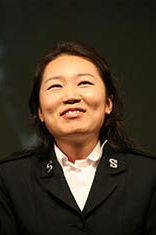 Ayoung Lee grew up in Korea, with her SA officer parents, with a dream of working in the opera. She started her training in her home country, but knew she needed to move to Italy, the home of opera, to make her dream a reality. Determined, she could be overcame her first hurtle - learning Italian. She was then accepted as a student at the prestigious Santa Cecilia Conservatory in Rome. During her studies she has joined the Rome, Italy Salvation Army Corps, where she is the pianist. Retired Commissioner George Jolliffe was a kind of mentor of mine when I was a young officer. In his younger years he was a secretary to the Founder of The Salvation Army and carried something of the influence of that close contact even into retirement. He told me that William Booth never missed an opportunity of making a spiritual contact with people he met, such as a cab driver, or the captain of a ship, or the host at a billet. Apparently a lot of early day Salvationists followed the General in this respect so that people expected an enquiry about their spiritual condition when they met a Salvationist in uniform which testified to faith and availability. I recently read a long article by a journalist commissioned to write about the Army and who, after a week of interviews, seemed surprised that only one person had broached the matter of his own spiritual experience. Does that indicate a lack of what used to be called a passion for souls or is it rather that we are so frightened of saying the wrong thing we do not say the right thing? JOYCE MEYER: How Can Peace Win in Spiritual Warfare? During my first several years as a Christian, I listened to a lot of teaching on spiritual warfare. I tried to learn all I could about defeating the devil because it was obvious he was giving me a lot of trouble. I wanted the upper hand for a change. Yet it seemed I gained no victory from applying all the methods I had learned—until the Lord graciously shared some truths that have become a blessing in my life. He showed me that spiritual warfare methods are good, but they are only car­riers, or containers, of His real power. I was busy rebuking, resisting, casting out and off, binding and loosing, fasting and praying, and anything else that anyone told me to do. The results were minimal, and I was worn out. I was approaching the point of spiritual burnout. This always occurs when a Christian continues to do things that do not produce positive results. But God opened a whole new way of looking at spiritual warfare after He chal­lenged me to observe how Jesus dealt with the devil. As I did, I saw Christ did not do a lot of the things I had been doing. A Danish politician has been convicted with “racism” and ordered to pay a fine for offending Muslims under a law which makes insulting someone’s religion a criminal offense. Former European Parliament member Mogens Camre, who currently serves as a Danish People’s Party councilor in Gladsaxe, was hit with a fine of 8,000 DKK (1186 USD), for a tweet in which he compared radical Islam to Nazism. “Muslims continue where Hitler stopped. Only the same treatment that Hitler got will change the situation,” Camre tweeted last July. After the tweet was reported, Camre was charged under the Criminal Code racism clause 266 b paragraph 1, which makes it a crime to offend, “a group of people (who) were threatened, insulted or degraded on account of race, color, national or ethnic origin, religion or sexual orientation.” The law is based on a United Nations directive. Prosecutor Natalja Lindberg claimed that Camre was blaming Muslims for the Nazi genocide when he posted the tweet. “I have never before been criticized for what I have written in my books, which are several thousand pages. But now I have been criticized for my utterance with only 140 characters,” Camre said in court. In one dream we have seven really healthy cows and in the other seven really healthy ears of corn. One would expect the healthy cows to consume the sickly ones and the healthy grain to consume the weak, thin ones. But the fact is, as Joseph mentions in verses 30, 31, as abundant, (maybe unbelievably abundant), as those first seven years' harvests would be, the seven years that follow would be so terrible as to wipe away all memory of the amazing harvests that went before. God can bless us more abundantly than we ever dreamed. We may have extraordinary experiences of his goodness, mercy, provision, and protection, and wonder why he has blessed us so? But when famine comes; when there is little sign of his blessing and everything is going wrong and it seems unending, and we wonder what awaits us in the future and where God is in it all, it is so easy to forget the extraordinary things God did in the past. That is why, frequently in the bible, God calls us to remember what he has done, what we have seen and heard and experienced. He would not do that if it wasn't that he knows our natural inclination to so quickly forget. 'Remember that you were slaves in Egypt and that the Lord your God brought you out of there with a mighty hand and an outstretched arm,' Deuteronomy 5:15. Why Is It So Hard for Christians to Pray? I've been perplexed for some time about a problem that has persisted in the church for years - and it concerns me deeply. The problem is, why is it so hard for Christians to pray? Scripture makes it clear that the answer to everything in our lives is prayer mixed with faith. The apostle Paul writes, "Be careful [anxious] for nothing; but in every thing by prayer and supplication with thanksgiving let your requests be made known unto God" (Philippians 4:6). Paul is telling us, "Seek the Lord about every area of your life. And thank him ahead of time for hearing you!" Paul's emphasis is clear: Always pray first! We aren't to pray as a last resort - going to our friends first, then to a pastor or counselor, and finally ending up on our knees. No - Jesus tells us, "Seek ye first the kingdom of God, and his righteousness; and all these things shall be added unto you" (Matthew 6:33). We're to go to the Lord first - before anyone! This is still the birthright of the army today. Introduction: In March of 1880 idle passers by in Castle Garden, New York City, thought the circus was coming to town. Descending down the gangplank of the steamer 'Australia' was an oddly uniformed man and 7 lassies waving flags never seen before in the USA. The man had been described as a 'lunatic' by his fellow passengers - for holding religious services all over the ship during the 4 week trip. The lassies had been described as 'half-a-dozen ignoramuses' by their own leader. As the curious gathered to investigate this strange mutation of Barnum and Bailey they were greeted with a hymn; "With a sorrow for sin, let repentance begin." Those who stayed longer heard the man - once again - get straight to the point: "You must be a lover of the Lord, or you won't go to heaven when you die!" 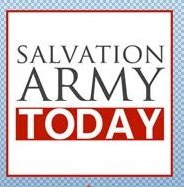 The Salvation Army was born in America - and it was magnificent Commissioner George Scott Railton and the 'splendid seven' lassies who marched down that gangplank and literally leapt into action. God Wants Believers to "Come Out!"